In Gantimpala Theater thirty-second season opener, the much revered awit Florante at Laura, under the direction of Soxie Topacio, Alfred Urieta portrays Menandro, the loyal best friend of the Albanian prince. For the past seven years, Urieta has been part of Tony Espejo’s drama company. He started with taong bayan roles prior to getting “speaking parts” that includes Bugan in the Aliw Awards 2005 Non Musical Production The God Stealer, Sergeant Tirona in Bombita, one of the revival plays presented during the First Pearl Theater Festival, and as Basilio, in El Filibusterismo, his most favorite role and biggest acting break.. 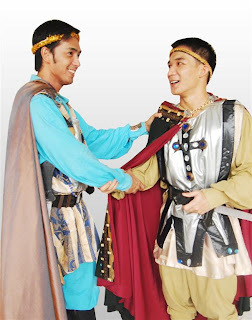 Being Menandro, the best friend and trustworthy comrade of Florante is a part that Urieta takes pride in doing and he is very much aware that this is not a “small” part. As one of the senior apprentices of Gantimpala Theater’s Actors’ Company, he appreciates the fine comments given to him by senior members with regard to the quality of his acting. In the nearest future, the other roles he wishes to do for Gantimpala are Adolfo or Aladin, Elias in Kanser (Noli Me Tangere), Don Juan in Ibong Adarna. Aside from acting, Urieta also does stage management work. He occasionally appears on TV. He is also a swimming instructor. Performances are slated on August 1 (6pm) Open Air Auditorium, in Luneta, Manila, August 7, 8, 9, 14, 15 and 16 (10am/2pm), AFP Theater in Quezon City and August 21, 22, and 23 (10am/2pm), SM Southmall in Las Piñas. (632) 899-5745, 896-3503 or 474-5198.